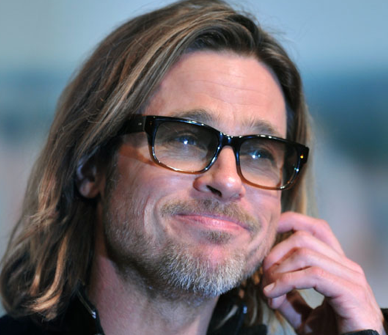 XOXO Jes - Canadian Entertainment News: Brad Pitt done with Acting? Brad Pitt done with Acting? My thoughts...there are two reasons why he said he was done with the acting side of the biz. Reason one, Bradley is fed up with Hollywood. He has been in the spotlight forever and wants to just be a normal dude. Unfortunately this is not ever going to happen. Reason 2, dude wants to finally capture the Oscar gold. Moneyball and The Tree of Life have both been getting some Oscar buzz...and wouldn't you be more prone to give Brad your vote if you thought these may be his last flicks? Um, yes...you would. Brad is not going anywhere. But I am hoping obsession with goatees and long hair disappears ASAP.